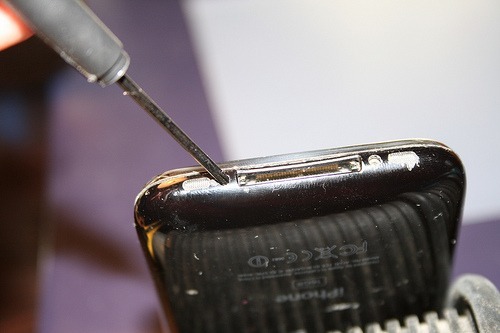 Want to find out how to repair / replace the glass front panel on your broken iPhone 3G? Read my complete tutorial to learn how. Update: You can find a Norwegian version of this article at nrkbeta.no and you can find a hardcopy in issue 22 of Make magazine. 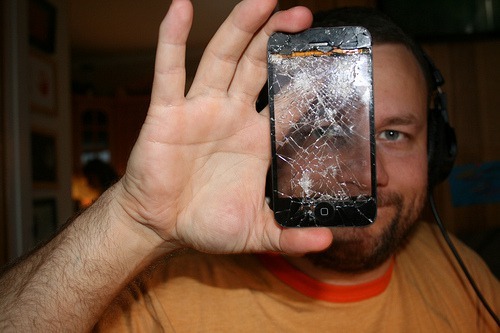 Like so many others I was unlucky, and dropped my iPhone and broke the glass screen. It doesn’t take much, I can tell you that. 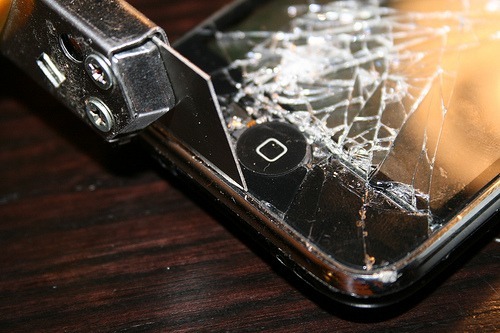 A 40 cm drop onto asphalt was all it took to transform my lovely iPhone into a cobweb of sadness. 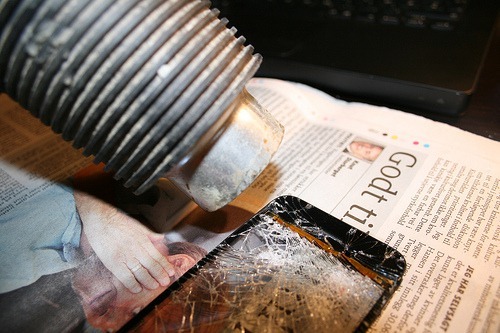 As you probably know Apple doesn’t repair this (at least not in Norway), so your options are a) to buy a new phone, b) to find someone who can fix it for you, or c) you can do it yourself. dripod.no are one of the few places in Norway that specializes in doing iPhone repairs, and for this particular job they (well, he, actually) charge 1000 NOK, or about $140 for parts and repair, not to bad really. Unfortunately he has so many customers that he has decided to only do the repairs if people come to his place of work themselves. I live 550 km from Oslo, so that is not really an option, though probably still cheap compared to buying a new iPhone. 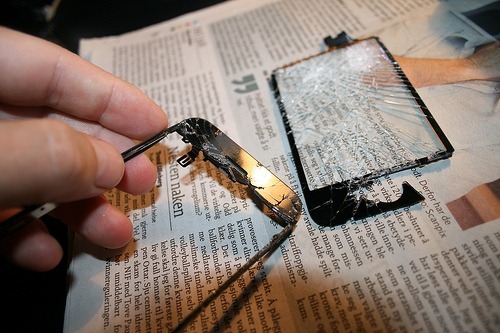 But I like fixing things, so I wanted to try replacing the screen myself. And so I did! And it wasn’t even that hard. Read on. – Tiny Phillips head screwdriver (I bought a kit from Deal Extreme for $3.00, the ones I had were worn down, www.dealextreme.com/details.dx/sku.11839~r.60507495. You also get some other useless plastic crap that really won’t help you at all). 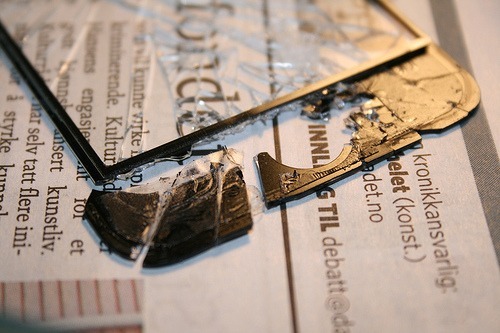 – A sharp knife with a thin blade, for prying loose the screen from the silver frame. Update: Use a small suction cup instead! – Double-sided tape (you can buy this pre-cut from the web (ifixit.com has it, see http://www.ifixit.com/iPhone-Parts/iPhone-3G-Front-Panel-Adhesive-Strips/IF137-006, or you can cut your own, like I did. – A box or something to keep the tiny screws in. – A tidy, fireproof, childfree environment. 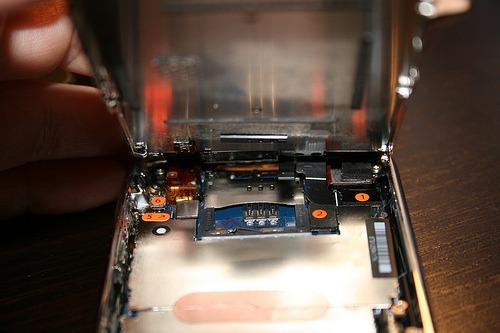 Find a paper clip and stick it into the the tiny hole at the top of the iPhone to pop out the SIM card tray. 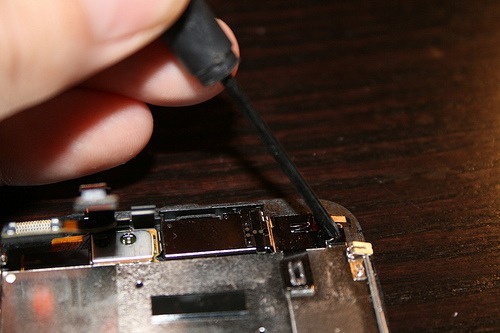 Then (this picture) unscrew the two screws located at the bottom of the iPhone (close to where you insert your charger). 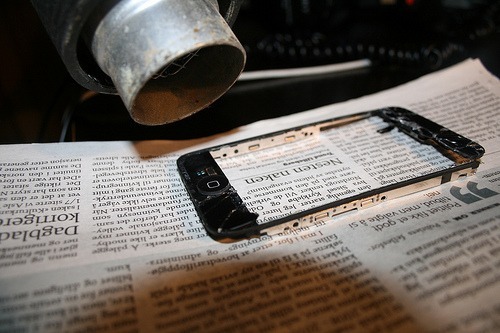 I had two iPhones, one to practice with and one to actually fix, but you probably only have one chance at this so be careful so you don’t damage the black rubber seal or the frame itself too much when you do this. Update! Find a small suction cup to do this step, not a knife. It works much better. You can find one in stores that specialize in lamps and lightbulbs, the kind you use to remove the halogen lightbulbs works great. Or: Place the knife blade (the thinner the better) in the crack between the black rubber seal and the silver plastic frame. You might have to use a little force, just dont overdo it. 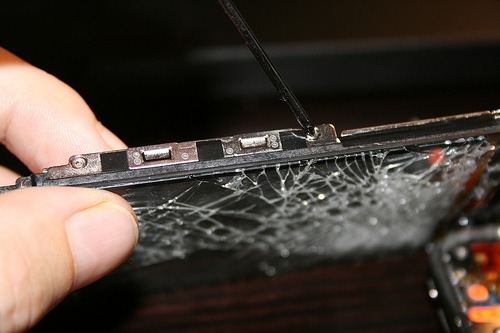 On one of the iPhones the screen came loose pretty easily, but on the other I had to try several times to get the blade far enough down to get the leverage I needed to lift the glass and frame up, which caused a little damage to the rubber edges of the frame. When you get the crack wide enough using the knife, you might want to use a guitar pick or another knife to wedge in then gently widen the gap. The screen + frame should lift up fairly easy. The next step is to disconnect the three cables conveniently labeled 1, 2 and 3, located towards the top of the phone. Use the knife to do this. Be very careful, don’t use too much force. The cable connectors labeled 1 and 2 lifts straight up, but number 3 is a little bit different. On some iPhones the No.3 connector is a tiny white flap that holds the cable in place (on my iPhone this “flap” is black), and you have to gently lift it up. (see the video at the bottom of this post if you are unsure). Then the last cable should slide out easily. 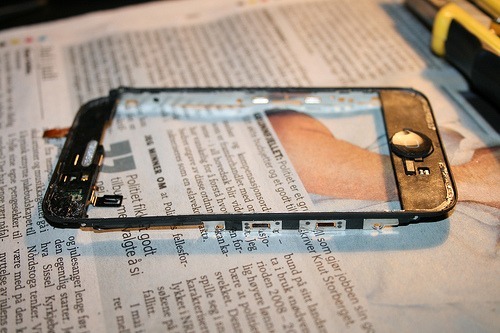 You have now separated the glass+LCD+frame from the body of the iPhone. Sweet! Now try putting it all back together again before continuing, so you know how it should feel when you do it for real later. No, really, I mean it! Congratulations, you have just voided your warranty! 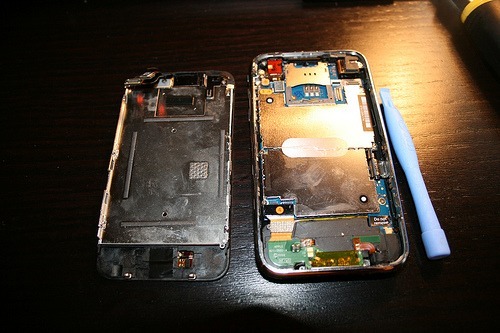 :) On the left you can see the backside of the frame and the LCD which you are about to remove. Separate LCD from the frame. Or LSD as I like to call them. There are three tiny screws on one side, and two on the other side, hidden underneath a piece of black tape. Unscrew all five. The last screw to be removed, I promise. This one is located towards the top. This screw and the five screws from the sides are all the same size, so you don’t have to worry about mixing them up. Put your knife, or similar thin instrument, underneath the LCD. 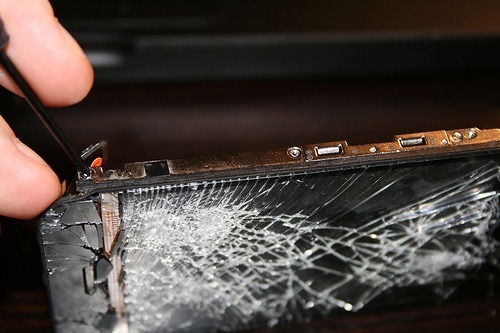 Try gently to lift it, just be careful not to use too much force as you might break the LCD. You should be able to slide the LCD gently towards you. Don’t rush this step! There is no feeling like destroying your own belongings (and then repairing them, preferably). Put a newspaper or some other highly flammable material (yes, that was joke) underneath the frame/glass , and turn on the heat gun or hair dryer. You have to experiment with distance and time, just don’t get carried away. The danger here is that you might melt the plastic or rubber, or make the frame itself warp from the heat. As I’ve mentioned I had TWO iPhones, so I wasn’t that nervous about destroying one of them, so I wasn’t devastated when I noticed that the frame had changed it’s form a little. Luckily I was able to fix it, by heating the frame a little and bending it gently back into shape. I’m not a neatfreak, but I must say I was quite pleased with the final result. iFixit suggests that you start with the top left corner, but I have no idea why. I noticed that the glass had already loosened on the sides, probably from getting knocked lose from the fall, so I decided to start there. I was able to remove the middle part of the glass front panel quite easily, even without a heat gun. But the glass at the top and bottom of the panel was really stuck. But by heating the glass in short bursts, I was able to find a way to heat the glass and the underlying adhesive enough for it to let go, and using my knife (and later a pair of tweezers) I gently removed all the small little glass fragments, one by one. It took perhaps a little under half an hour. The most important thing at this point is to not damage the frame, so don’t use too much force. You must BECOME the phone, little grasshoppah! 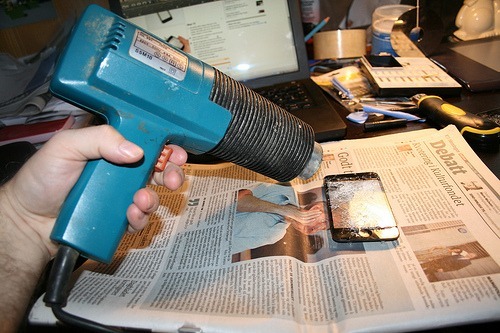 :) Use the heat from the heat gun to soften the glue/tape, and you will be fine. Depending on how broken your screen is you might be able to remove the entire front panel in one fell swoop, but you are more likely to end up with something like this. The glass front panel is fastened to the frame with clear double-sided tape on the top and bottom. Because there are alot of electronics placed in these areas (like the speaker and certain sensors), you have to cut the tape/adhesive film into shape. 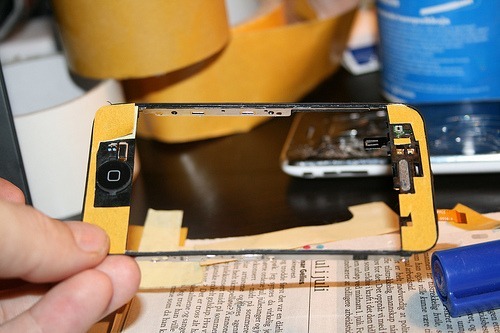 The part near the Home button is the easiest, while the top section is quite intricate. 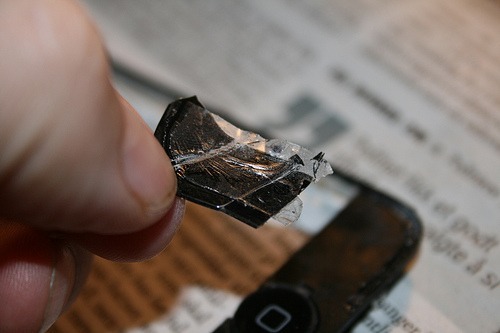 Use a knife or flat head screwdriver to scrape of as much as you can of the remaining adhesive. In addition to double sided tape, Apple seem to have used some kind of silicon or rubber cement to fasten the glass around the edges. If you have acetone or some nail polish removal you might use that to try to rub it clean. I used a “q-tip” (cotton swap, not the Hip-Hop artist) and some electronics cleaner spray for this. It is of course important that the surface is as clean as possible before the next step, you should at least remove anything loose. It is important that the new glass front panel is set at deep into the frame as possible. I felt a little lazy so perhaps I didn’t do this step properly, leaving my new glass raised a little bit higher than the original. I actually had two rolls of double-sided tape lying around, but you should be able to find this stuff in any good hardware store. I hope someone has the time to draw and share some kind of template for this, but it’s not hard to make your own. 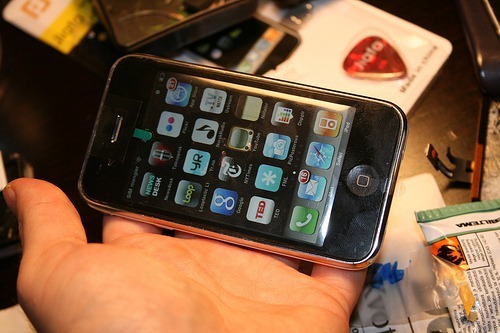 The new glass front panel I ordered from Deal extreme was protected with thin translucent plastic, like the piece you can see in this picture, that matches the shape of the iphone perfecly. The plastic is a little sticky, so I just placed it on top of the protective layer of the double-sided tape, and simply cut around it. As you can see in this picture you have to cut shapes in the adhesive strips to leave room for the home button on one side and the speaker and various sensors on the other side. You basically want to cover as wide an area as possible. A tip: For the top section with all its weird shapes, I put a piece of translucent plastic (a plastic bag actually) on top of the frame, and used a permanent marker to color the pieces I had to cut out. I then taped this on top of the double-sided tape, and went bananas with the scissors. Put the tape in place and press down hard for a while. 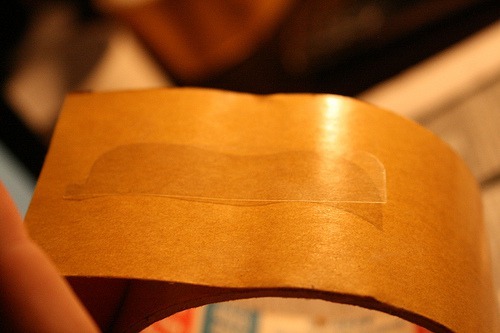 Then remove the top layer of the double sided tape. Wash your hands or wear gloves to avoid staining the glass too much (especially on the side that will be on the inside). 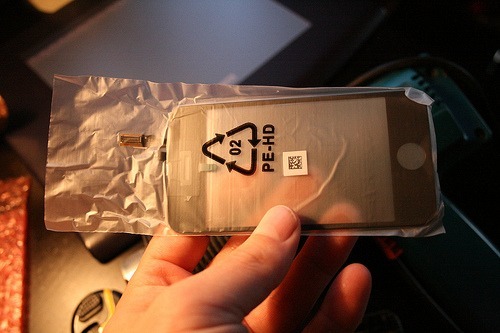 Remove any plastic strips that might cover the glass on the inside, leave the plastic cover on the front side. I didn’t bother taking any pictures of the next step, but it should be pretty self explanatory. You place the lower part of the panel in the frame, make sure you have it perfectly in line with the lower edge, and then carefully lower it down. Make sure the cables connected to the panel doesn’t get stuck on the tape, and use your fingers to make them go under the frame. The tape is pretty sticky, but you will be able to move the glass a little bit back and forth as you adjust its position in the frame. When you are happy with it’s position, press it down hard. Then add pressure on one corner at a time, for about 20-30 seconds, allowing the glass to fasten. And voila, the hard part is done! 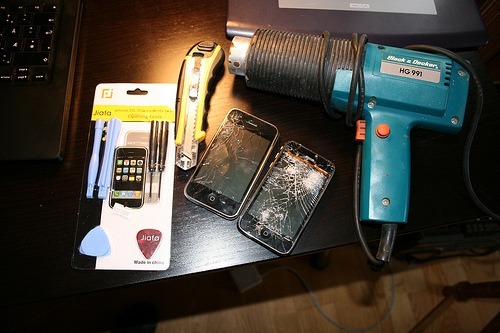 Now it’s time to reassemble the iPhone again. 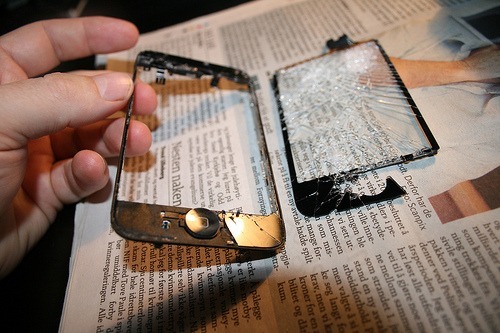 Iphone 3G, good as new! 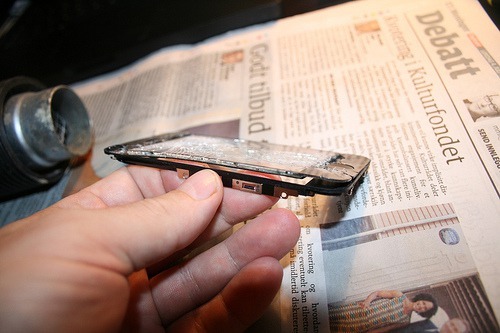 I skipped the reassembly in the tutorial, just follow the steps in reverse. 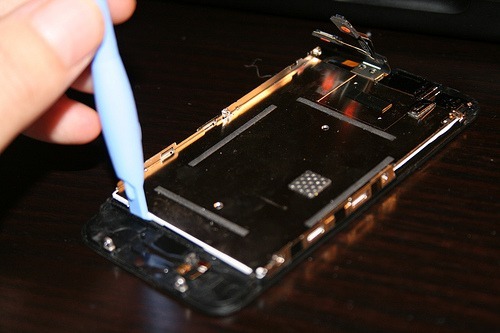 First fasten the LCD with the six screws, then attach the three cables. Be careful when reattaching the cables, don’t apply too much pressure. If you break the connectors you are basically screwed! There is also a cable that runs in a loop, and you have to bend this loop so it points down towards the home button. If you don’t it will get in the way of the SIM tray when you put it back in later. When the three cables are properly connected you can turn on the iPhone and test it without putting the panel completely in place. Test to see if everything works before you press the glass and frame completely in place (if you do you have to use the knife again to lift it off again, perhaps causing more damage to the frame). Now, go forth and brag to all you friends, and feel pride in a job well done and money and environment saved! 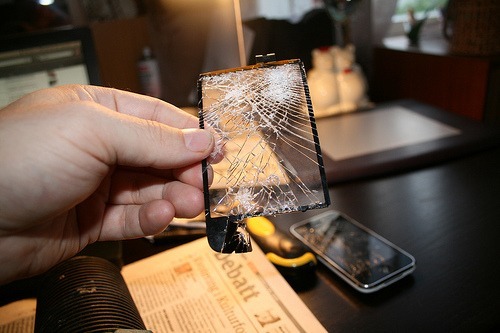 Update 14.04.2010: I broke my screen again, and fixed it the same way, but on this new repair I’m having some problems with the screen becoming unresponsive. 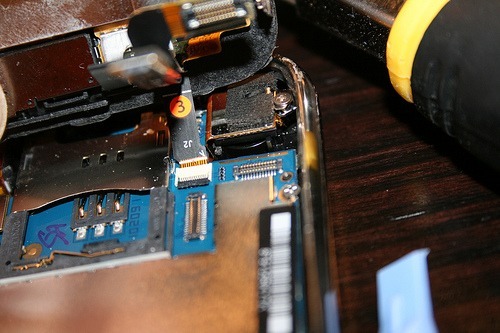 It was also harder to get the connectors to snap in place, but I don’t know if it’s because of something I did different, or if it’s related to a change in quality from the company that makes the replacement screen. 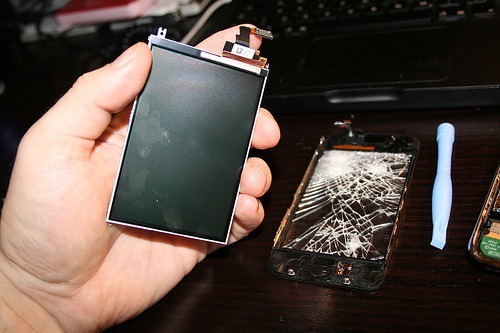 I’m ordering a third replacement screen now for another phone, and if I’m getting the same problems on that one I will pull the link to the dealextreme page.